Frederic Remington created The Buffalo Horse in 1907. This grouping of figures is balanced on the rear legs of the buffalo, with support from the lance at the front of the buffalo. 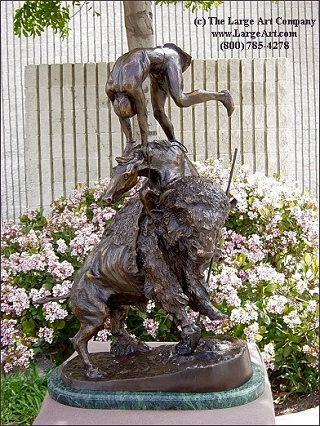 Remington studied the buffalo at the Bronx Zoo and worked for several weeks using his notes to help create this sculpture. The Buffalo Horse was completed in about 6 weeks, and was considered to be "a literal scene" of the unsettled west, according to Harper's Weekly.